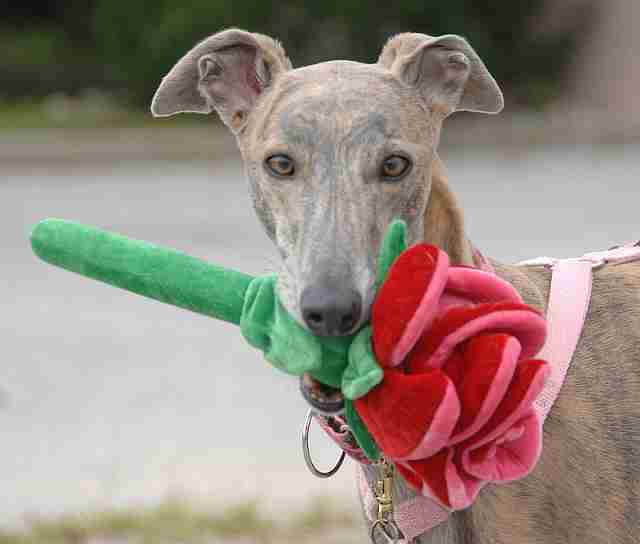 This sweet scene can turn dangerous if a dog is inclined to chew on a petal or the stem. Photo copyright Praveen Mutalik. The dog is choking. What do you do? First of all, never give your dog something to chew on unless you will be within earshot of the animal. It only takes four minutes for disaster to occur. Some of the culprits can be round chew discs of rawhide (particularly disastrous since they can occlude the entire airway), rawhide bone pieces, pigs ears, hot dog pieces, grapes or anything else the dog picks up in its mouth. Your dog is like a toddler in many ways; everything goes in the mouth. First, do a finger sweep of the mouth if your dog will let you. One of the first things you must teach your hound once it is acclimated to your house is to trust you enough to allow you to put your hands in its mouth without biting. This is also a perfect opportunity to begin tooth care by brushing with the specialized soft bristle brushes that veterinarians recommend. If you suspect a piece of “something” is caught, open the mouth to inspect it. If you do not see anything but your dog is coughing, stand by but do not try to pound it on its sides, or heimlich the dog. The head will drop down lower than the chest and the dog will try to dislodge the piece itself. If you hear a shrill sound like a whistle, that could be a sign of stridor (something irritating the vocal chords). Time to go to the vet if it continues past a couple of minutes. If you fear that the airway is obstructed, put your hand near the animal and check for air movement. Before you try to determine where the diaphragm is you can lift the dog’s hind legs and get the dog into a tilted, head-down position. If no air is moving, place your hands on either side of the dog at the area below the lungs and diaphragm and push your hands forcefully towards the dog’s chest. The important thing is to determine whether air is moving at all through the dog’s airway. If you are uncertain whether the dog has a foreign object in its throat but it is drooling, pacing, restless and coughing, get the animal to your vet. There, an x-ray can determine where the object is located and with the dog sedated, the vet can remove the object with a laryngoscope or esophagoscope. Never hesitate to bring your animal for medical attention during or after an episode that frightens you. Left untreated, the foreign object can promote infection, development of fistulas and life-threatening situations. Prevention is the best medicine, of course. Watch your animal as it chews on its dog bones and toys. Do not leave your animal at home unattended with chew toys available that it can get apart. Instead, make the giving of the toy or treat a special event. One of my greys inhailed a piece of food while eating. Spooked when she couldn’t cough it up, I rushed to the vet. Yep, there it was on the X-ray, a piece of dog food. After about 15 minutes of oxygen (the vet tech was getting it too due to the size of the gas muzzle) she managed to cough it up. Cammie still does this from time to time. I’ve found that patting her chest works best to help her cough it up.